Patterns in radial growth have often been used to predict forest decline since they are regarded as indicators of the tree responses to long-term stressors. However, the sensitivity of tree growth to climate, as a proxy of the trees’ adaptive capacity to short-term climatic stress, has received less attention. 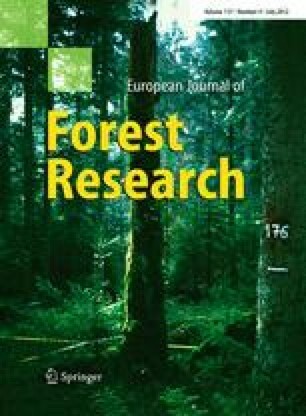 Here, we used retrospective tree-ring analyses to determine whether growth patterns and sensitivity to climate are related to Abies alba (silver fir) decline in the Spanish Pyrenees. We used regional climatic data to calculate normalised temperatures and drought indexes. Basal-area increment (BAI) was measured for declining (defoliation >50%) and non-declining (defoliation <50%) silver firs in four stands with contrasting decline levels. A dynamic factor analysis (DFA) was applied to test the hypothesis that declining and non-declining trees have experienced different long-term growth trends. Growth sensitivity to climate was computed as the average change in BAI per unit of change in a given climate variable. Declining trees showed a negative growth trend during the last 20 years. Trees with lower relative BAI and negative BAI trends showed stronger growth sensitivity to climate and higher defoliation than trees with the opposite characteristics. Our findings underscore the idea that long-term climatic warming seems to be a major driving factor of growth decline in Pyrenean silver fir forests. Ongoing growth reduction and enhanced growth sensitivity to climate may promote vegetation shifts in these declining forests located near the xeric edge of the species distribution area. The online version of this article (doi: 10.1007/s10342-011-0572-7) contains supplementary material, which is available to authorized users. This study was funded by project RTA01-071-C3-1 (INIA, Spain) and Gob. Aragón. We thank E. Martin, J.L. Vázquez, C. Lastanao and M.A. Pascual for their help. We also thank two anonymous reviewers for his helpful comments and discussions. J.J.C. acknowledges the support of ARAID and an ETH guest scientist grant. We thank AEMET for providing climatic data. This work is humbly dedicated to Ceci and Blanquita.